Voting on the ratification of our 2017-2020 contract ended at 12:00PM today. 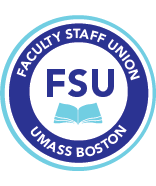 Election Question: Should the proposed collective bargaining Agreement between the FSU/MTA/NEA and the UMass Board of Trustees be ratified? The FSU contract ratification election is coming to a close. Voting will conclude at 12PM on Thursday, July 19th. Your ballot was sent to you by Ballotbin, which is a software we use for our elections. In a few cases, the emailed ballot was directed by members’ email providers into spam, promotions, or junk folders, so make sure to check those. The FSU has arrived at a tentative agreement with the administration on our contract, everything except parking. To move the agreement to adoption and implementation requires a vote by FSU members. This email explains the ratification voting process. The Elections Committee will conduct the ratification vote. The FSU 2017-2020 contract has been agreed to and now requires ratification by FSU members. To ratify our contract, members need to vote which means we are holding a ratification election. You will be sent a ballot no later than Friday, July 13th at 9AM EDT where you will vote yes to ratify or no not to ratify the contract. Voting ends at 12PM EDT (noon) on Thursday, July 19th. A more detailed email will be sent July 12th regarding your ballot receipt.